2018 is going to be an auspicious year. But then again, every year that we're still alive is an auspicious year. Did you know that about 92% of the people who make New Year's resolutions fail every year? I think they don't achieve their so-called New Year’s resolutions because they seem daunting or too far-fetched after a day or two, like a drastic diet change or fitness regime. Start with small achievable simple things that you can do every day to create good habits and thus, voila, cultivates well-being. Start small and it will have a rippling effect on the rest of good habits. Here are small and simple habits I still practice every day. Upon waking up early each morning, remain in bed, smile and feel your breath coming in and out for about 5 breaths. Naturally, do more if it’s too enjoyable. Then get up. Do not “BBQ” in bed – it’s a Vietnamese expression that means when you wake up, you get up. Avoid rolling, tossing or turning like a veggie kabob on the grill. After waking up, the first thing I consume is a tall glass of water to hydrate myself from the night’s sleep. Your body loses water (and carbon dioxide) through your exhales each night. If you’re on the go, carry a water bottle with you and drink the equivalent of another 4 to 5 more tall glasses of water throughout the day. Sometimes we confuse thirst with hunger and end up eating instead of drinking. A simple and inexpensive form of exercise is walking outside. 10 minutes is a good start to get the blood or Qi (energy) circulating. If it is too enjoyable do more or continue later on in the day. When walking, enjoy Mother Nature’s views and sounds, say hello or smile to the people that cross your path. Coordinate your steps with your deep breaths. Feel a sense of ease and joy in your steps. Avoid listening to music or getting lost in thoughts. Walk to just walk. Or, jog to just jog. After your walk, take 5-10 minutes to stretch out your muscles and mind. I prefer to practice yoga or Qi Gong where breath is coordinated with movement to help keep my mind from wandering. This also helps me stay focused on what I’m doing. I named this pose “smilasana” in yoga. Smile at everything that you do, like driving, cutting up the vegetables, taking out the garbage, strolling in the supermarket, standing in queue, walking from A to B, and in activities or chores that you don’t care for. One day you’ll find joy in it. Smiling helps me find ease and peace in myself and in what I’m doing. The way I see it is I always have a choice; to suffer while doing the work or to find joy in doing the work. Why suffer when you have a choice, right? Use every moment to smile and enjoy your breath. This simple practice reminds me that I’m still alive and often helps me to realize that whatever it is that I’m struggling with is smaller than I perceive it to be. How wonderful it is to smile to my aliveness every day. If not, it likely means that I’m dead or walking around like a zombie. Fun facts about smiling. It only takes 17 muscles to smile but 43 muscles to frown. Smiling produces “feel good” chemicals. Our teacher says, “Smile to offer yourself and others your freshness.” To me smiling is like offering myself a fresh bouquet of flowers without having to spend money on flowers. 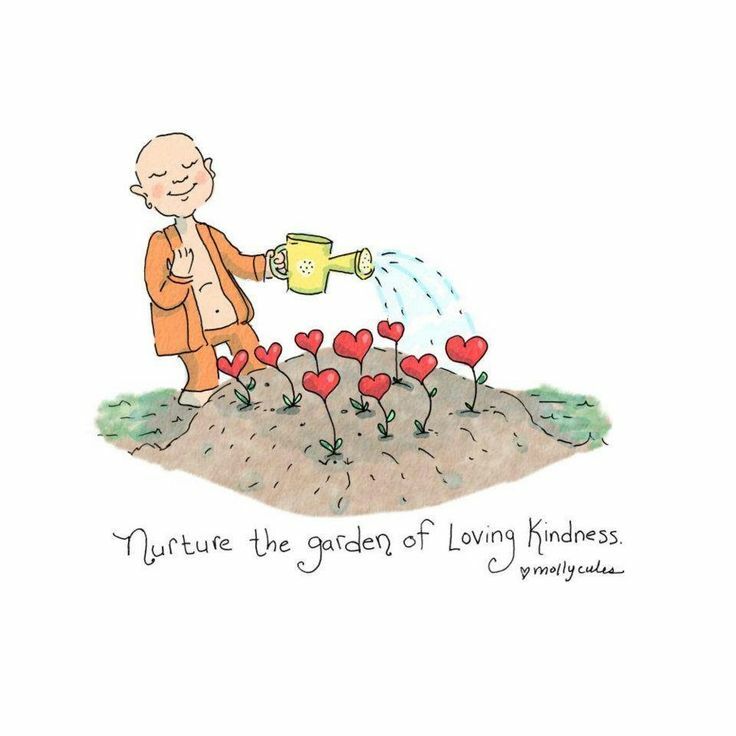 Water your garden and stay positive. When I complain, swear, or have negative thoughts, I water the weeds in my garden and I’m the first receiver of this suffering, and then the people around me are the second and third receivers of my negativity. Nobody likes to be around a complainer or a negative person. It is exhausting. We also lower our self-worth and lose the ability to heal. Take a moment to come back to your breath before reacting. Your breath is real. Sister Dang Nghiem at Plum Village says, “The strong emotions experienced are just states of mind. Come back to your breath.” Physically remove yourself from the negative situation if you need to. Look for the good or accept the situation without negativity. This requires conscious practice and deep looking to help you understand your behaviour and perception. Buddha says, “Where there’s perception, there’s deception.” Understand yourself and understand the other person. Remember that 90% of our suffering is self-inflicted. Be open and curious. Our experience often deceives us into believing what’s right or wrong. This is dangerous. Take time each day to rest your body from the doing and the mind from the overdrive thinking. It can be as simple as sitting or lying down for 5 to 10 minutes and just be. Just be with your breath, so the mind can come home to its body. You can do this anytime of the day. This is why I love savasana, the resting pose, at the end of every yoga practice. On a side note, have you tried yoga? Spend quality time with your beloved ones. When you’re with your loved ones, really be there with them. This means avoid getting distracted with your laptop, TV and other devices. I like to put my phone on silent or out of sight. I’ve also turned off all the pop-up notifications from social media. I allocate some time every day to take care of important messages and emails. Sarah and I have made a pack that whenever one of us is on our device and the other person starts talking, we stop using our device and give our full attention to the person who is talking to us. We both feel strongly that the presence of another person is more important than laptops or smart phones. If it's an urgent email that we need to give our full attention to, we ask the other person to give us silence for x minutes. Our teacher likes to remind us when we fight, disagree or suffer, “Where will we all be 300 years from now?” Treasure your moments with family and friends. May your 2018 be nourished with loving kindness, peace and joy.